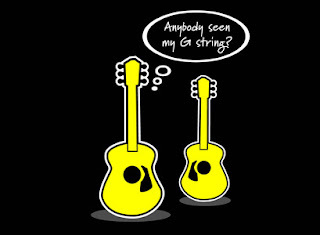 Ah, the classic jest rooted in the fateful tuning of the third guitar string. If you play guitar then you know what I'm talking about. If you happen to break that third string, it becomes a race to see who can realize the wide open opportunity to be the joker, at least for the moment. As far as music t-shirts go, this one stands in a league of it's own. Whether or not that league is above or below the rest, we don't know.